Gum or periodontal disease is the leading cause of tooth loss among adults in the United States today. Nearly 80 percent of the population has some degree of this bacterial infection. In addition to harming your oral health, gum disease has been linked to overall health conditions such as heart disease, strokes, diabetes, pregnancy complications, and more. Therefore, treatment is essential. One method is scaling and root planing. This therapy removes harmful bacteria that may eventually begin to destroy gum or bone tissue, and could migrate to other parts of the body. 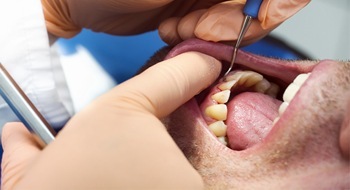 Read on to learn more about gum disease and scaling and root planing in Weatherford. In a word the problem is plaque, which is the sticky substance that develops in the mouth every day. When bacteria in plaque accumulate along the gum line, they can begin to irritate this soft tissue. Eventually, you may notice swelling, sensitivity and bleeding when you brush. Interestingly, not brushing or flossing well is often what causes gum disease to start. So if you do see bleeding when you clean your teeth at home, continuing to brush and floss regularly may be the key to reversing the initial effects of early gum disease, called gingivitis. In fact, advanced gum disease—called periodontitis—is the leading cause of tooth loss among American adults. The disease not only devastates gum tissue, but also weakens the bone structure that supports your teeth. In extreme cases, teeth may need to be extracted. To help you avoid the myriad oral and general health issues that can result from advanced periodontitis there is scaling and root planing. During this procedure, a dentist in Weatherford removes plaque, bacteria, toxins and tartar (hardened plaque) from the visible surfaces of your teeth and from below the gum line. Once this step is finished, the roots are planed, meaning the surfaces are smoothed so that bacteria cannot adhere as easily under the gum line. To ensure bacteria are completely eradicated, a topical antibiotic may be applied to your gums, too.